Looking for a small gift for your favorite hippo collector? 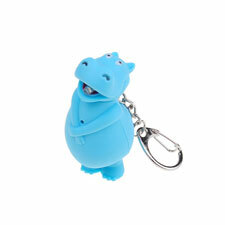 This charming hippo LED keychain is a whimsical but useful item for everyone. A bright LED flashlight turns on at the press of a button to light up any dark corner or front door while the hippo makes noise to scare off any intruder. The key chain is equipped with a spring-loaded clip that makes it quick and simple to remove or add keys. It's lightweight and portable and is made from rubberized plastic and metal. Batteries are included. Measures 1 3/4" high. Gray only.